A lively upright script based font on letters inked with a pointed pen. In its default setting, Caprizant is understated and readable enough to use at smaller sizes — in short blocks of body copy, it can easily mimic beautiful handwriting. Alternates of every letter, plus dozens of ligatures, provide convincingly human variation. 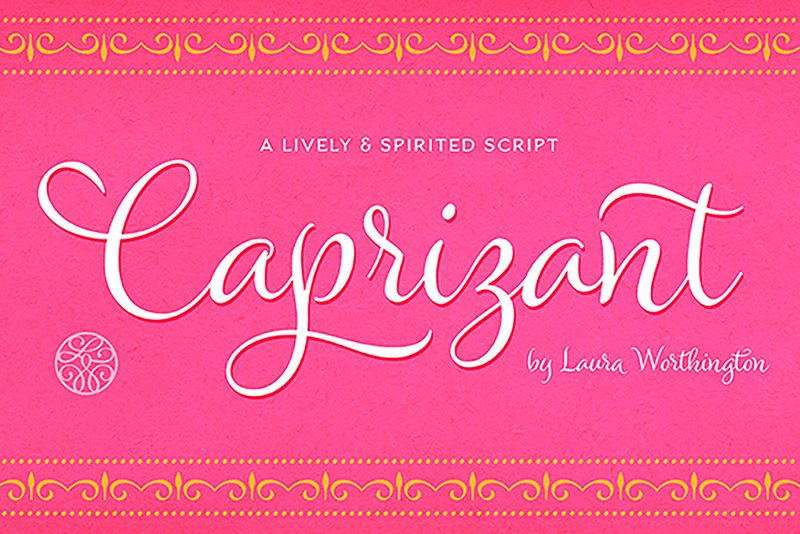 For display settings, titles, and identity work, Caprizant shines with more energy and elegance. Dress it up with 392 swash characters, two sets of alternate capitals, and ornaments. It even includes a disconnected version, to strike a more casual tone. Great news! Laura Worthington fonts have been specially coded so that almost anyone can access all of the swashes, alternates and ornaments without the need for professional design software. File size is approx 2MB (4.5MB unzipped), offered as a single download.